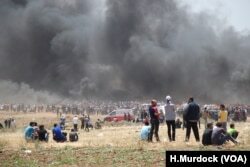 Through the thick black smoke of burning tires, the crowds that gathered at the eastern border of the Gaza Strip could see scores of young men and boys dragging wire fencing away from the Israeli border. Many of the youths wore gas masks made out of soda bottles and bits of cloth, as tear gas rained down periodically. "God is Great!" shouted some onlookers, as others cheered. The protest, one of many in the Palestinian territories and around the world, was in objection to the U.S. Embassy opening in Jerusalem, a city both Israelis and Palestinians have long claimed their own. By the end of the day, authorities in Gaza called for civilians to disperse as bomb blasts hit military targets in the territory. Israeli authorities said the strikes were in response to recent militant attacks, including firebombs thrown at Israeli soldiers, according to Tel Aviv-based news outlet, Haaretz. The Ministry of Health in Gaza said 52 people were killed and more than 2,400 were injured throughout the day, with more than 130 of the injuries "critical" or "serious." 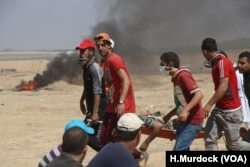 At the protests, ambulances roared through the fields gathering the injured. When there were not enough vehicles, protesters lifted injured people in their arms or onto gurneys to run them out of the mayhem. After the fence is breached, ambulances roar out to protesters carrying the wounded, May 14, 2018. However, without enough vehicles, many of the injured are carried out by fellow protesters. But for many Gaza protesters, the embassy opening was secondary to their larger goal-to return to lands held by Israel since 1948. "We want to live," said Mohammed, a 23-year-old protester with black fabric covering his face. "We want to go back to our lands, whatever the cost to us." Protests are expected to continue this week and beyond, as Palestinians observe what they call the "Nakba," meaning the disaster, on May 15. Nakba marks the expulsion and flight of Palestinians during the 1948 war and the continued rejection of their "right of return," a key sticking point in peace talks between Arabs and Israelis. Millions of the descendants of those displaced are still refugees in the Palestinian territories and in neighboring countries. Tear gas hits people on the ground who are partially masked by smoke from tires that Palestinian protesters burn to create cover in Gaza, May 14, 2018. The protests are part of six weeks of demonstrations that began in late March. Hamas, the main governing body in Gaza, has called the events, "The March of Return." Hamas — all or in part — is designated as a terrorist organization by several countries, including the U.S. and Israel. "These protests are different," said Mohammed Abo Askar, the head organizer of a demonstration in northern Gaza along the Israeli border. "We are leaving all weapons aside and it will be peaceful." 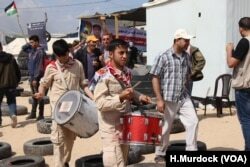 Boys play the drums to excite protesters who say that even after 70 years of displacement, they still want to return to their homes in the Gaza Strip, May 14, 2018. But as the youths charged the fences, many carried rocks in slings, saying that taking down the fence was not an act of violence, because they believe the land beyond is their birthright. "The peaceful protests won't continue forever," Abo Askar added. "If things don't change, we will go back to using our weapons. This is a promise."